The very brief Gospel reading this morning tells us that the infant Jesus was circumcised eight days after His birth, as was ordered in the Old Testament Law of Moses. A month and a day from now we will observe a feast day in honor of His presentation in the Temple and His mother's purification from the ritual impurity of childbirth. 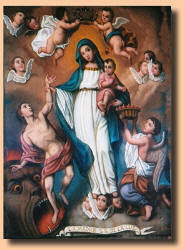 Most likely, you are asking yourself why the Son of God and His most holy mother would be required to do these things? Circumcision was the ritual by which boys were joined to the tribe of Abraham, and incorporated into God's chosen people—how, indeed, could the Son of God be in need of such incorporation? At the presentation in the Temple, as a first born Son, He would be “bought back” from God, to whom all first born males belonged. But again, how could He be “bought back” and why would He need to be? And how could the Blessed Virgin Mary have incurred any sort of impurity by giving birth to her Divine Son? Clearly, Jesus and Mary needed none of these things. The answer lies in their devotion to God and the obedience to His laws. They didn't have to, but they give us the good example of their obedience—something that we all can stand to emulate. To be clear, while the moral law found in the Old Testament is still binding on us, none of the ritual observances of the Mosaic Law are any longer required. Under the New Covenant there are no ritual impurities, no need to redeem the firstborn, no need to circumcise, no need to keep kosher, and so on. In fact, we would be guilty of false worship if we were to perform any of the sacrifices prescribed in the Mosaic Law. The Sacraments, sacramentals, and the Holy Sacrifice of the Mass more than replace the rituals of the old Law. Do not think that I have come to destroy the law, or the prophets. I have not come to destroy, but to fulfill…. He that shall break one of these least commandments, and shall so teach men, shall be called the least in the kingdom of heaven. It is not enough to say that we have the Faith—that we believe in Jesus Christ and all that He teaches—our words have to be matched by our actions if they are to be of value. Faith is essential to “justification,” but justification is not salvation. Faith prepares us to accept Jesus Christ as our Savior—it “justifies” us in preparation for the saving waters of Baptism. But, under normal circumstances, life goes on for some number of years after Baptism. It is up to us to preserve our Baptismal Faith, remaining in God’s good graces through frequent Confession and Holy Communion throughout our lives, keeping the Commandments and doing good things. You believe that there is one God. You do well: the devils also believe and [yet they] tremble. But will you know, O vain man, that faith without works is dead? Depart from me, you cursed, into everlasting fire which was prepared for the devil and his angels. For I was hungry, and you gave me not to eat: I was thirsty, and you gave me not to drink. I was a stranger, and you took me not in: naked, and you covered me not: sick and in prison, and you did not visit me. I say to you, as long as you did it not to one of these least [of my brethren], neither did you do it to me. These shall go into everlasting punishment: but the just, into life everlasting. We may not have to keep kosher. We may not have to circumcise our children or present them in the Temple. We may never know ritual impurity. But we are still very much under the Law—the Law which Jesus came to fulfill. Today we read about Him shedding the first drops of His Precious Blood for mankind. As the new year plays out we will read about Him shedding the final drops of that Blood on the Cross. We are a “purchased people”—purchased by our Lord with His Blood—He has every right to demand our good behavior and our good works. For then, and only then, can we expect to hear our Lord say on Judgement Day. Come, ye blessed of my Father, possess you the kingdom prepared for you from the foundation of the world.